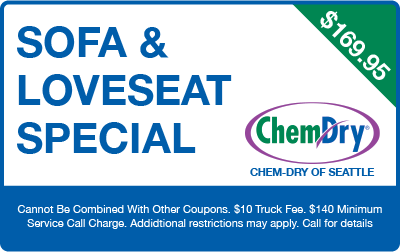 *Must mention/present coupon at the time of estimate or scheduling. Carpet & upholstery cleaning offers pertain to our HCE cleaning method. 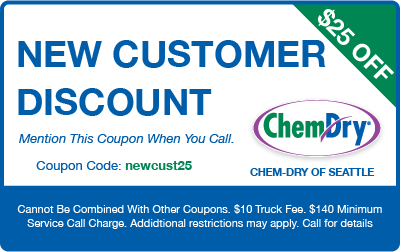 Coupons valid only at Chem-Dry of Seattle. Serving all of Seattle, including: Lake Forest Park, Shoreline, Mount Lake Terrace, Brier, Edmonds, Lynnwood, Mill Creek, Mukilteo, Everett, Lake Stevens, Snohomish, Monroe, Kenmore, Bothell, Woodinville, Kirkland, Redmond, Tukwila, SeaTac, Burien, Normandy Park, Des Moines, and the surrounding areas. © 2019 Chem-Dry of Seattle. Independently Owned & Operated in Seattle, WA. Powered by Digital Marketing Access.